Due to popular demand, we have added another felted tote bag class to our Fall Fiber Arts Schedule. On September 28, we will be meeting in our fiber arts studio to felt one of a kind tote bags. They are truly functional art pieces. 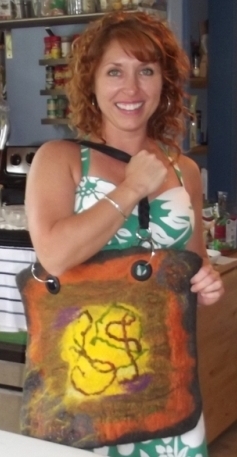 No previous fiber art experience is required to make these gorgeous bags. 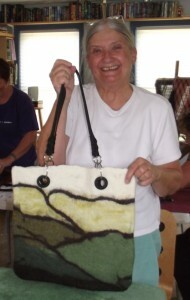 The class will be taught by local fiber artist Karen Simpson. We will be using the wet felting method, which allows us to create unique fabrics from colorful wool and natural alpaca fibers using warm, soapy water and rubbing. The class will meet from 9am to 5pm, with lunch provided. The class costs $80, and $30 for materials. We hope you can join us for this fun day. Preregistration is required, a $25 deposit will reserve your space. You can sign up in the shop, by phone, or online. We also have a few spaces left in our October Weaving a Shawl on the Triangle Loom. It is scheduled for October 25-27.